The front page of this weeks Surrey Now Leader was a revolting paid ad by none other than the fallen Godzilla herself. It claimed that there are only two choices for mayor in Surrey, Tom Gill and Doug McCallum. It then quoted Dianne Watts from her lapdog's article in Harold Munro's cheap tabloid of corporate trash who said Doug McCallum would be a step backwards. Not. I wasn't going to comment on it because for local residents it is self explanatory but for those who don't live in Surrey I will explain why people who live in Surrey hate Dianne Watts so much. It's really simple. We live here. We saw what she did. Dianne Watts was anything but fiscally responsible when she was mayor. She led the city in record spending and put us in record debt. Her mandate was spend money and raise taxes. She spent more money than the left did because she is a neo con. No she is not a new conservative. She is a new con artist. Everything she says is a lie. Let's start with the most obvious lie. When Dianne Watts was mayor she lied to the press and told them she was t boned by someone who ran a red light on her way home from a drunken gala. The press printed that lie without questioning it simply because she was Godzilla. Contrary to her claim, she t boned the other vehicle her vehicle was not t boned. That part is indisputable. The disputable part was which party ran the red light. She claimed the other party did. The other party claimed she did. Local residents who knew the intersection knew Dianne Watts was lying again so she settled out of court. She is dishonest. For Dianne Watts to claim Doug McCallum is a step backwards is actually hilarious. Those of us who live here know that Doug McCallum's record on crime and fiscal responsibility was flawless which was in complete contrast to that of Dianne Watts who was anything but. Her claim to fame when she was elected MP was the fact that she never showed up to work. Dianne Watts claims Doug McCallum is a step backwards because she is facing the wrong direction. She is facing fiscal irresponsibility and crime promotion. 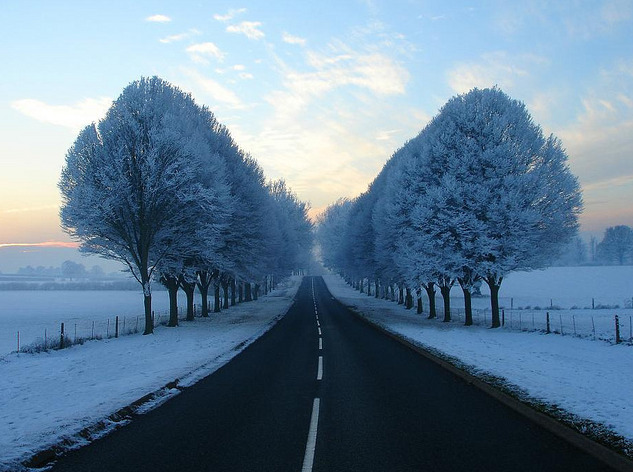 Doug McCallum is facing the other direction towards fiscal responsibility and crime prevention. Something she talked a lot about but never confronted. BTW how much of a salary is DW pulling from that "Non Profit" society Surrey First? She just doesn't want to lose another meal ticket. I mentioned the ad to a coworker and he said Who is Tom Gill? I've never heard of him. He's the one involved with the allegation of voter fraud. Tom Gill denied any involvement but we who live here know he is doing what Dianne Watts does best - lie. The Wake up Surrey movement within the South Asian community in Surrey blew the whistle on election fraud with mail in ballots. None of the other south Asian Candidates were involved. The allegations solely involved supporters of Tom Gill. Recently Barinder Rasode gave an interview about why south Asian voters don't support Tom Gill and it has nothing to do with his race. It is because of his corruption. Barinder was a member of Surrey first then ran agaist Dianne Watts and Linda Hepner for mayor. 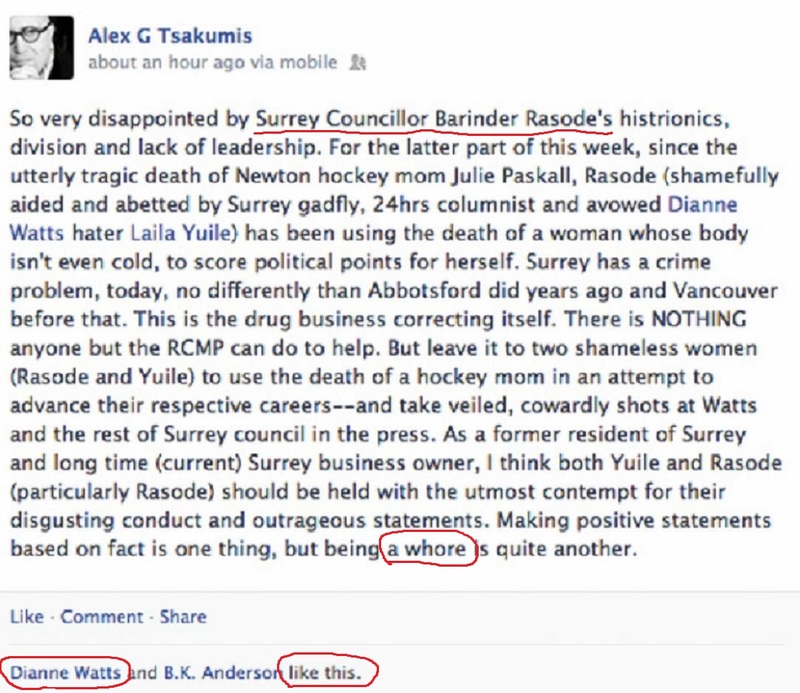 That is why Dianne Watts and Alex Tsakumis called her a whore on facebook. They didn't have a problem with Barinder dating Bob Cheema when she was on their slate. They all of a sudden had a problem with it when she left their slate. They didn't want to lose that meal ticket. In the recent interview Barinder claimed she was too white for the brown voters and too brown for the white voters. I beg to differ. I didn't endorse her because she voted for that dirty casino on rural land despite the public opposition to it just like Tom Gill and Barbara Steele did. That is why she lost the support of the South Asian community. She defied them. It had nothing to do with her race. That's the same reason they don't endorse Tom Gill. He defied them. If you want to vote for a south Asian who isn't involved in the dirty politics vote for Rina Gill. She is competent and honest. She would make a great deputy mayor. Just to set the record straight.